Hi there. Welcome to my day of the Quilt Qwazy Queens. I'm so glad you joined us on the Quilt Qwazy journey. I hope you've been following along since the dawn of time, International Quilting Day on March 19th. There have been some very interesting and inspirational stories and beautiful quilts. 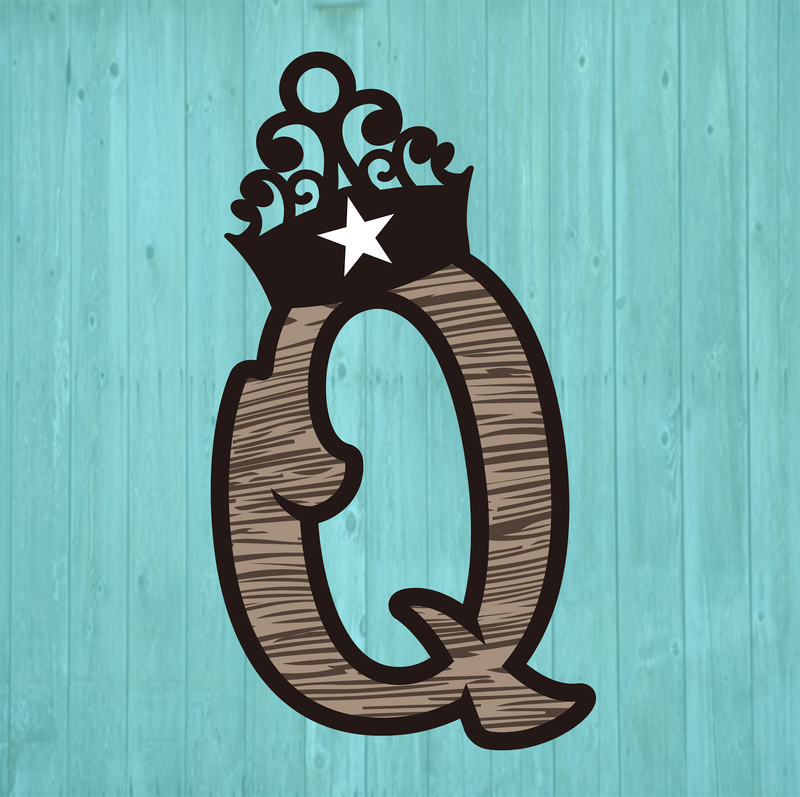 Marian at Seams To Be Sew is our head Quilt Qwazy Queen. She has done a fabulous job of lining up some great Qwazy Quilters and some awesome Qwazy Quilt Giveaways. Sew.... Once upon a time there was this little girl named Doris Cotten. She lived in a small town in Southwest Missouri with her mom and dad and two sisters. Doris' mom taught her how to sew at an early age, just 7 years old. Doris made mostly clothes but at the age of 13 she made something Qwazy. She made her first quilt. And there you have it ladies and gentlemen. Sew began the journey of Doris. She had the perfect last name... Cotten.... the spelling was a little different but Cotten still the same. And Sew began the love for anything red, white, and blue; even back then. I love how Dad didn't just sign his name, he added character to his name. I entered this quilt in the fair and if I remember correctly, it won a blue ribbon and was chosen to go on the Missouri State Fair. It's just a simple quilt, four patches and rectangles around signature blocks that I embroidered, along with mom's help. My second quilt didn't come along until about 10 years later (circa 1983) when I made this quilt. I was so proud of it. But oh how pathetic it is. It was a quilt as you go and I had just purchased my serger so what did I do.... I set it together with the serger... OH MY! And look, no binding. I serged the edge... because well... no one showed me how to put a binding on. An even bigger OHHHH MYYY!!! If my Grandma Cotten were still alive she would have shown me how to do that. She was a very prolific quilter. I remember going to her house and all the closets were FULL of quilts she made. Sadly lots of those quilts disappeared (I'm pretty sure I know where they went though). I was lucky enough to be the recipient of 2 of those quilts. They are among my most prized possessions. And A grandmother's flower garden quilt. As I was thinking about what I was going to write and what quilts I was going to show you, I realized that most of the quilts that mean the most to me aren't necessarily quilts I've made. They are quilts someone else has made. Like this quilt from the King's grandmother. Funny thing about this quilt is that she made it for his parents for a wedding gift in 1950. However she wouldn't give it to them until she thought they would take care of it. They didn't receive it until after she passed away. I guess when you have 5 boys you're never in the position to "take care of it". And the King's mother made 6 quilts in her life, one for each of her 5 boys and 1 for her only grandson. I am lucky to have 2 of them. This is the quilt she made for William, her grandson. My best friend's mom (from high school) made this quilt for me for graduation. It was a quilt as you go type quilt. I still love it. And William made this quilt when he was about 13 for Mother's Day for me. Over the years I've tried a lot of things that contribute to my Quilt Qwazy Queen status. Miniatures- this one is 12" x 18" and my very first mini. Needle turn applique (which I will probably never do ever again). But enough about me. You've stuck with me through all of this so how about a little giveaway. 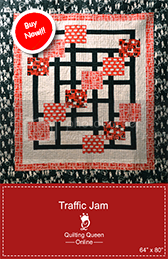 Hoffman is generously giving about a fabric bundle of 885 Bali Dot Collection. 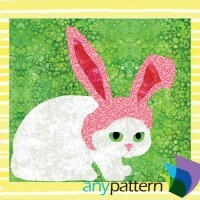 Any Pattern is giving away a Free pattern "The Easter Kitty"
Just use the rafflecopter gadget to enter for these two giveaways. 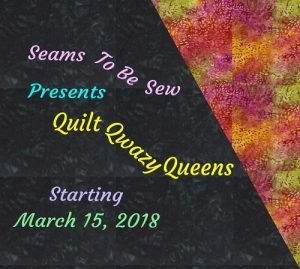 Head on over to our Quilt Qwazy Queen Bee's blog (that would be Marion at Seams To Be Sew)and you'll find even more giveaways. 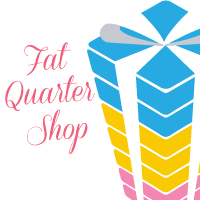 During the blog hop, the Fat Quarter Shop is also giving everyone who purchases something at their shop a 10% discount. When you check out, just use the coupon code seamstobe316. Be sure to visit all the Quilt Qwazy Queens today. They too have some fabulous giveaways and stories. Have a fabulous Quilt Qwazy Weekend. Great story and beautiful quilts. The best thing about quilting is the feeling of accomplishment with the completed project. And creating a project with a purpose. Thanks for sharing your story and your beautiful quilts! I love making charity quilts for the children's Ward at my local hospital. My first quilt was for my son, about 35 years ago! What a journey! Very nice, Doris. You've accomplished so much! I really enjoy making quilted pieces, it is my passion! The best part is surprising someone with a quilted gift!! I do some "sane" quilting but I found Crazy Quilting about a year ago and fell in love. Love your signature quilt - so fun! I love how quilting allows me to be creative and relax at the same time. Oh, such wonderful quilts! So special that your son made one for you! I love to see what projects people are making, and love making things for someone else. I am most Qwazy about color and creativity in Quilting, thanks. Doris, your story is such a great and fun story.. I love the serger quilt, that is pretty cool.. and that you weren't afraid to tell us about it.. Truly a cool quilt. I love it.. Now, you must have been some kind of really great best friend to get a quilt from your best friends mom for graduation, and the fact that your son also made you a quilt says a lot about the kind of person you are. I've seen some of your other projects before, again, they are always just so beautiful. I've seen that triangle circle flying geese like pattern before, and wish I had the pattern for it. I would love to make that, I bet it's far more of a challenge than it looks. You are so lucky to have so many beautiful quilts, yours and those made by others! What treasures! I loved your story about the serger and the binding. It makes me laugh to think of some of the mistakes I made when I was beginning. Thanks so much for sharing your wonderful journey. All the quilts you shared are beautiful. I am most crazy about fabric scraps. Right now I have three scrap quilts in different stages of making and I have one done waiting to be quilted. thanks for the cute giveaway. Your journey was very interesting. Right now I am crazy about scrappy quilts. It took me a while to let go and do uncontrolled scrappy. Thanks for sharing your story and some of the interesting methods you used at the beginning of your quilting journey. Enjoyed your quilt show! I have some quilts from my grandmother and from my husband's grandmother - such treasures! You have a lot of quilting in your background. I chuckled at the serged edges! I'm sure it seemed so clever back then. So many of us are self taught and can look back at those early pieces and cringe. I'm qwazy about rulers. thank you for sharing your wonderful journey. 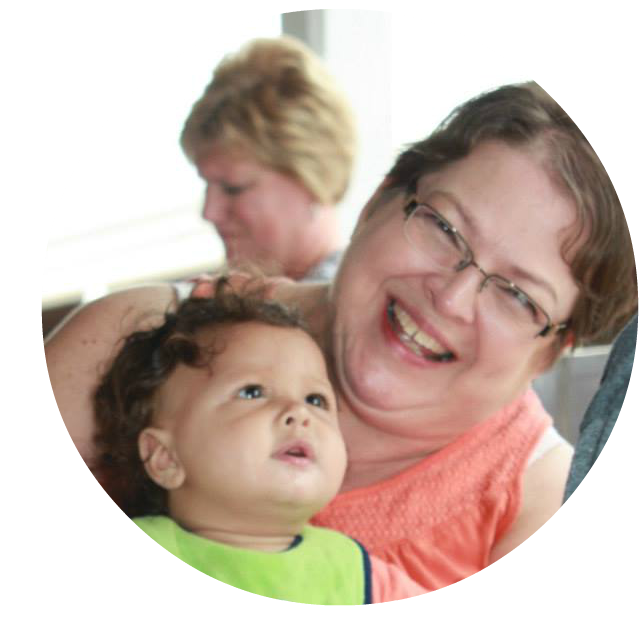 i am crazy about making and giving away ie... new baby, wedding, etc. I would like to start making for my husband and I now. I love your story! You certainly have a quilty background. Loved seeing all the old quilts. If you saw my stash you'd think buying fabric was my Quilty Quaze! But like you I have tried lots of different quilting techniques over the years & love them all. I hear ya on the needle turned applique! I love your quilts from your husband's grandmother. I believe you should use them and enjoy them. Them more used they are, the more loved they are! I love the serged quilt...sounds like something I would have done just so I could use a new sewing toy! Your quilts are always a pleasure to look at and your work is amazing. Thanks for sharing! I love the fact that William made your Mother Day quilt. I have seen him in a lot of your posts but never realized he quilted too. I have notice that the few men you see quilting always move on to being great quilters and designers. Did you get that William. Your work is beautiful as I have followed you. You have inherited some wonderful quilts and memories. I love your story...thanks for sharing. I still have some fabric from dresses I made for my daughters that I am incorporating into a quilt now. What fun peeking into your roots of quilting. Oh those days when we had no idea how to really do things, but we made it work anyway! I love that quilting gives me a creative outlet and the chance to buy some awesome fabrics. I have loved fabrics most of my life as I have sewn garments since the age of 9 urs. I love your needle turn applique quilt - so colorful and shinig. and the other quilts are wonderful as well! It is so fun to look back and see where you started and see what you are making today. Thank you so much for sharing your work. I love your paper pieced geese. Great design. What am I craziest about? I'd say picking the fabric and then seeing how it goes together. What beautiful quilts you have collected through the years. It is amazing that a young man made that quilt also. Usually they have no patience or time for that kinda thing :) I would have to say my Qwazyness is from making stuff. I love making quilt tops. But I am also shinied and start on something and end up working on another. I guess that is why we quilters always have atleast 5 projects going on at the same time. :) Thanks for sharing in this wonderful hop. Have a great Easter. Thank you for sharing your history with quilts, from your first efforts to family heirlooms. The Quazy Quilt with machine embroidery was something I needed to see. JUST LOVE YOUR QUILTING! I'M QUAZY ABOUT YOUR QUILTING! Qwazy about making my own patterns. It looks like you've come a long way! I love your story. The part I like best about quilting is the cutting and piecing! For me the best thing about quilting is being able to make unique handmade gifts for family and friends. As for the process of making quilts, piecing is my favorite part, especially paper piecing. Enjoyed reading your story! I enjoyed your post so much. I also did not get any quilts from my grandmothers, tho they had made many. I know what happened to the quilts of one g-ma and the person with them wouldn't share. The other g-ma's quilt went to another family member and when she found that I quilted, she gifted me two. They are precious to me. All your quilts are so pretty and precious because of their story. I enjoyed your blog. Thank you for sharing your story! I am quazy about finishing quilts. I love your post you dabble in every technique. Thank you so much for sharing. What beautiful quilts you have! I have a tied quilt my grandma made for me. I'm so Blessed to still have it. I really enjoy quilting and the relaxation it gives me as well as something I can or pass down. I really enjoy piecing, but I've recently fallen in love with hand applique. It's nice to have something so portable. I don't have an artistic bone in my body but am trying to learn to quilt. I'm fairly new to quilting and still fear cutting the material but would give my eye teeth to be able to do such great work. I am qwazy about the whole quilting procedure, especially putting the binding on. Thanks! It changes for me all the time. I just got a new to me table that I'm using as a cutting table. It's the right size for me so it's a joy to cut stuff. My husband told a visiting friend..."so that's all she does now is cut." I'm Qwazy for it! I think the part of quilting I enjoy the most is putting pattern and fabric together. I don't need to do drugs -- I get my high as I pull the fabrics to go with the pattern. I also get really excited as I see the actual quilt taking shape. I love seeing how different colors and prints go together. It is also fun to be able to give the quilts to someone who will enjoy them. I'm crazy about seeing my family enjoy the quilts I've made for them. I love all those vintage quilts-- you are lucky to have them! I love gifting quilts because I can really create them with the person in mind and therefore it's a very personal gift. You are so lucky to have beautiful quilts made by mothers and grandmothers. The quilts I have that my grandmother made were made for warmth not beauty. They are old suits and weigh a ton! Still, they are keepsakes to me. Qwazy about applique! Love looking at your family quilts. Right now I'm working on finishing projects I started long ago. So I'm basting one quilt, FMQing another one, then FMQing the first quilt and waiting to have three ready for binding - then I'm going to do all three at once. I haven't been successful with mitered corner binding so have done curved corners and envelope style finishes. I want to do mitered for my next three quilts. I enjoyed seeing your quilts - the one given after she passed away with the polka dots is especially awesome. Thanks for sharing! I love the artistry and the creativity of quilting. The day isn't right if I haven't done at least a little sewing. Thanks for sharing your story, your quilts and the giveaway. I love quilts with pictures on them, particularly foundation pieced quilts. I've only been quilting since 2011, so I haven't done nearly half of all the techniques I want to try. This year I'm focused on finishing some of my UFO's. So far I have completed 2 and I'm binding the third. I enjoyed reading your story and seeing the quilts....I especially liked the use of the polka dot fabric in the fan quilt your husband's mom made. Love your "quilt story. I am qwazy about the whole process of quilting. Sure beats watching the politicians on T.V.! I think I'm the most quazy about fabric - some fabric is really hard to use, even in quilts. Quazy Queen, you are so lucky to have that amazing collection of quilts. Wow! I so enjoyed hearing about your first quilts - goof-ups and all. I love picking out fabrics, love you FPP! I enjoyed reading your story. You were very lucky your mother taught you how to sew and that you still have your grandmother's quilts. Thank u ou for sharing them. I love making quick quilts, that look more complicated than they are. Please don't enter me for the pattern giveaway. 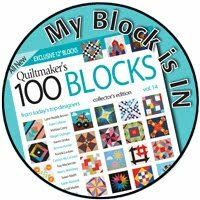 I am a Quazy Quilter about all things quilting! I spend countless hours looking at fabric, imagining projects, and as much time as I can actually quilting. I have made several quilts, using varied techniques. Thanks for sharing your stories. Ooops, my comment went off with out me finishing. =) Thanks for your stories and the photos of your quilts. I love the tradition you have, and the traditional patterns you have made. Loved your show and tell (especially the antique family quilts, what treasures). The thing I am most quazy about is fabric--for me it's all about the fabric--it's where I get my inspiration! The reason I'm qwazy about quilting is knowing that after I'm gone my quilts will live on for a long time! I love the fabric, the math, the planning.... I love it all. Just piecing the quilt together gives me such piece. I am glad I have found quilting. I am afraid that I might find my first quilt pretty pathetic too once it is finished, but I really thought yours was lovely for a first quilt. I love making baby quilts! Most of my recipients have been my grand children but I have also made many to give to mission projects. Thanks so much for sharing! I love the whole process of making a quilt. But my favorite part is the quilting part. Thank you for sharing your quilting story and quilts. I love quilting for my grandchildren, all 21 1/2 of them. 5 are girls and the rest are boys! Thanks for sharing your quilting story Doris! Your early quilts look like my early quilts! I'm qwazy about the whole process of quilting from selecting the fabrics to sewing the final binding. These days I'm sewing with my 5-year-old granddaughter, and it's so much fun! Loved seeing your quilts. I had to chuckle because I had no one to teach me how to quilt either, and there were no quilt books and classes where I lived 50 yrs ago, sooo I made a few "interesting" quilts to begin with. We live and learn. I love the stories behind the quilts. The ones I make don't thrill me as much as my grandmother's. Thank you. The inspiration I acquire from various bloggers and quilt shops to make that special quilt for that special someone. Thank you so much. You started sewing quite young, and have certainly progresses. I enjoyed following your story and your quilts. I love playing with the color!!! that's the most fun. But then I gotta "make" the quilt to se if I am right. So the next favorite part is putting the binding on cause now its done! The thing I like best about quilting is how relaxed I feel when chain piecing blocks. My mind can wander, but the work still gets done. Thanks for sharing photos and your quilting story. I love this post. Lots of great eye candy. I love all quilts, and picking fabrics, piecing, quilting and even binding. It's all a blast. Thanks. Hi Doris! I really enjoyed seeing your favorite quilts and where they came from. Your "oh, my" comments gave me a giggle! We do what we think is best at the time...the same applies to many situations in life. We live, learn and go on. thankfully! Love your grandmother's quilt and the strawberries. I really enjoy how the same fabric can be used in so many ways and the beautiful design that results is always a surprise to me.